All three games in the #3 UCLA @ Nebraska series went into extra innings and despite strong showings by Gerrit Cole, Trevor Bauer and Adam Plutko, Nebraska won the Series 2-1. South Carolina star closer Matt Price gave up 6 runs in less than an inning as Clemson evened up the series 1-1. #6 Texas beat #9 Stanford 4-2 to take the series 2-1. Adam Plutko – RHP – UCLA – Fr. 6IP 6H 0ER 2BB 7K. Bruins pen lost this game and eventually the series against Nebraska. Jordan Pries – RHP – Stanford – Jr. 4.2IP 5H 3ER 2BB 4K. (L, 2-1). AJ Vanegas – RHP – Stanford – Fr. 0IP 0H 0ER 2BB 0K. Tyler Hale – RHP – Arizona – So. 6.2IP 6H 3ER 3BB 3K. 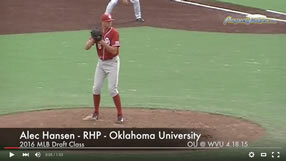 Karsten Whitson – RHP – Florida – Fr. 5IP 7H 2ER 1BB 4K. Grayson Garvin – LHP – Vanderbilt – Jr. 5IP 3H 1ER 1BB 4K. (W, 2-1). Kevin Ziomek – LHP – Vanderbilt – Fr. .2IP 0H 0ER 0BB 0K. Navery Moore – RHP – Vanderbilt – Jr. 5IP 3H 1ER 1BB 4K. Matt Price – RHP – South Carolina – Jr. .2IP 4H 6ER 2BB 0K. (L, 0-1). Price, who was so good against Clemson in Omaha last year has an awful outing. Jordan Cooper – RHP – Kentucky – So. 7IP 3H 1ER 3BB 9K. (W, 1-0). Sam Stafford – LHP – Texas – Jr. 5.1IP 3H 0E 2BB 7K. Brooks Pinckard – RHP – Baylor – Jr. 2IP 2H 1ER 2BB 0K. Kevin Brady – RHP – Clemson – So. 4IP 3H 1ER 0BB 4K. Buck Farmer – RHP – Georgia Tech – So. 6IP 4H 1ER 3BB 8K. (W, 1-1). Kevin Jacob – RHP – Georgia Tech – Sr. 1IP 2H 0ER 1BB 2K. Matt Barnes – RHP – Connecticut – Jr. 7.1IP 4H 0ER 3BB 6K. (W, 1-2). Barnes and UConn finally living up to potential with 3-1 over California. Matt Purke – LHP – TCU – So. 6IP 1H 0ER 1BB 6K. (W, 2-0). John Simms – RHP – RIce – Fr. 2.1IP 7H 3ER 0BB 1K. Chase McDowell – RHP – Rice – So. 1.1IP 3H 3ER 2BB 1K.